Look for the “Big Five” while following the animals of the Great Migration. Learn about the contribution of Louis and Mary Leakey during a field trip to Olduvai Gorge. At a Maasai village and a rural community, learn how the migration impacts the lives of the indigenous people. Each year 2 million animals migrate between the plains of the Serengeti in Tanzania and Masai Mara in Kenya, a journey of 800 miles. The migration is dramatic — considered to be the largest movement of wildlife on earth. Witness the highlights of the migration from strategically placed mobile tented camps and study this phenomena and its impact on the land, the animals and the people living on the periphery of the migration route. Visit the Ngorongoro Crater and Olduvai Gorge — the Cradle of Mankind — as we follow in the hoof prints of the migrating animals. Evening: Arrive at Kilimanjaro International Airport. After clearing Immigrations and Customs, please look for the Road Scholar representative who will be waiting outside the secured arrivals area with an Road Scholar sign (applies to participants arriving on international Road Scholar flights). Transfer to Arusha. Arrive at the lodge and check-in. This is an international travel day; no meals or program activities are scheduled on this day. Activity note: Please be aware that program activities and scheduled times could change due to local circumstances. In the event of changes, we will alert you as quickly as possible. Thank you for your understanding. Morning: Program Orientation. Get to know your group leader and fellow Road Scholar participants during a welcome and introduction session at the hotel. We will review the up-to-date daily schedule and any changes, discuss responsibilities, safety guidelines, emergency procedures, and answer any questions you may have. Lecture: Tanzania's Unique Role in East Africa. An introduction to Tanzanian history and current events. Excursion to Shanga Beads: learn about their mission and visit their gallery. Afternoon: Depart Arusha and journey southwest to Tarangire National Park. Arrive at the lodge and check-in. Orientation to the property. Lecture: The Elephants of Tarangire National Park and an Introduction to Local Conservation Efforts. Evening: Time at leisure at the lodge. Breakfast: Early morning target species game drive in the national park. Our focus today will be on the elephants of Tarangire and the seemingly inverted baobab trees that dot the landscape. Tarangire has one of the highest elephant population densities in Tanzania, making this a prime location for observing these social pachyderms. Return to the lodge for a late breakfast. Morning: Time at leisure to rest and enjoy the lodge's amenities. Take the opportunity to recharge your batteries after today's early start and ready yourself for the afternoon activities. Afternoon: Afternoon game drive in Tarangire National Park. The Tarangire River snakes through the national park that bears its name. Wildlife travel long distances; drawn to the area's only permanent river. The 1,096 square miles of protected lands are home to a large variety of game such as: wildebeests, elephants, zebras, gazelles, elands, gerenuks, lions and leopards. Extensive grasslands, dusted with the occasional acacia or baobab tree, provide the optimum conditions for viewing wild animals. Bird lovers will not be disappointed-- there are more than 500 avian species found at this park including: Yellow-collared Lovebirds, Rufous-tailed Weavers, Ashy Starlings, Stocking-thighed Ostriches, and Kori Bustards. Return to the lodge. Morning: Begin transfer to Lake Manyara. Visit to a local school* (if in session) for interaction with the students, followed by walking orientation of Mto Wa Mbu Village to meet a variety of the village folk as they go about their daily tasks. *Note: Although not required, previous participants have enjoyed taking coloring pencils/pens and other basic supplies to donate to the local school. Lunch: Enjoy lunch in the village with a local family. Afternoon: After lunch, visit a local Maasai market. Arrive at the lodge, built in a style reminiscent of a Maasai village, situated on a high ridge with beautiful views of Lake Manyara. Evening: Optional visit to Mto Wa Mbu Village to enjoy some drinks at the local bar. Morning: Early morning visit to a Maasai village to experience the simple and uncluttered lifestyle of the Maasai. Begin transfer to the Central Serengeti region. Lunch: Boxed lunch en route. Afternoon: Continue with transfer to the Serengeti National Park. After going through the park gates, enjoy your first game drive in Central Serengeti. Here, the open grasslands are interspersed with small rocky outcrops, home to small mammals and reptiles that are not touched by the migration. This is also hyena country which brings into focus the scavengers of the migration and their role as the "waste management specialists" of the migration. Arrive at the camp and check-in, followed by a camp orientation. Evening: Lecture: The Great Migration, Points to Ponder. Breakfast: Early morning breakfast at the camp. Morning: Game drive in search of the big cats (lion and cheetah,) with site lecture, ‘Do the lions follow the migration, fact or fiction?’ Return to the camp. Afternoon: Time at leisure. Game drive in search of the unsung little creatures of the Serengeti (for example the dung beetle) and the vital role they play the overall ecology of the migration. Return to the camp. Evening: Presentation: Is the Future of the Migration in Jeopardy? Morning: Transfer south to Ndutu. En route, enjoy a game drive and a visit to the Serengeti Park Headquarters. Lecture: The Role of the Rangers and Staff of the Serengeti National Park in Monitoring and Protecting the Wildlife of the Park. Lunch: Box lunch at the Serengeti Park Headquarters. Afternoon: Continue with transfer to Ndutu and en route game viewing. Ndutu is one of the favorite birthing places for wildebeests and zebras. The grasses in the southern Serengeti are nutrient rich, which prepare the young wildebeests for the 800 mile journey that lies ahead. Arrive at the camp and check-in, followed by free time to rest and freshen-up. Pre-dinner discussion about wildebeests and their adaptation mechanisms. Evening: Time at leisure at the camp. Morning: During this morning's game drive we will be looking to witness the birthing of wildebeests. In the southern Serengeti, the young wildebeests grow quickly and gain strength for the long trek ahead. Lion, cheetah, and hyena revel in the easy pickings as they also nurture their young. Ready your cameras-- photographic opportunities are plentiful! Return to the camp. Afternoon: After lunch, enjoy some free time to relax at the camp. Zebras will be the focus of our afternoon game drive. Learn about these uniquely striped equines and what they do to ready themselves for the "great migration." Return to the camp. Sundowner discussion: The Significance of the Migration on the Two Million People that Live on the Periphery of the Serengeti. Dinner: Farewell to the Serengeti. Dinner at the camp. Morning: Transfer to Ngorongoro Crater via Olduvai Gorge. Stop at the "Cradle of Mankind" for a field trip to Olduvai Gorge's famous archeological site. Site lecture: Louis and Mary Leakey and the Discovery of Homo Habilis. Lunch: Boxed lunch at Olduvai Gorge. Afternoon: Continue with your transfer to Ngorongoro. Take a moment to enjoy your first view of the Ngorongoro Crater! The view of the crater from the rim is truly one of nature's great spectacles -- thousands of animals choreographed on a 360 degree "stage" 12 miles in diameter that is the crater floor. Arrive at the lodge and check-in. Pre-dinner presentation on the Ngorongoro Conservation area and the formation of the crater. Breakfast: Early breakfast at the lodge. Morning: Descend into the crater in 4x4 vehicles for a full morning game drive among one of the most unique concentrations of wildlife on earth. Viewing animals from so close, with a backdrop of the wall of the crater, provides outstanding photo opportunities. Lunch: Boxed lunch at the Crater. 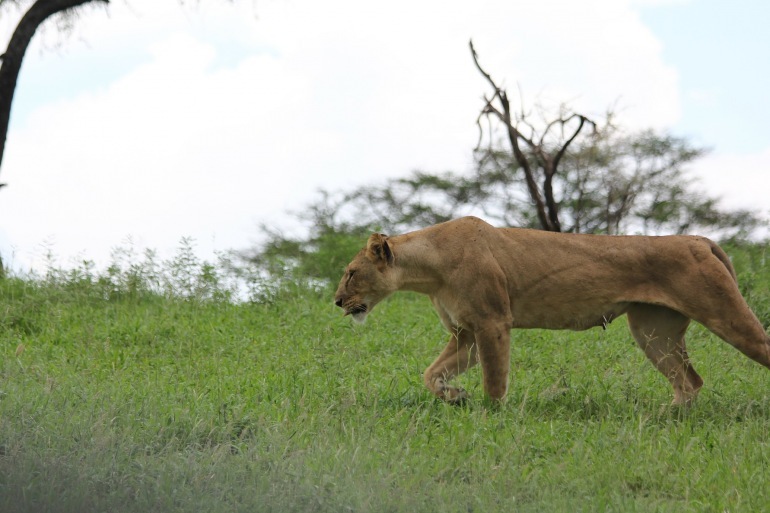 Afternoon: Continue with game drive activities in the Ngorongoro Crater. Return to the lodge and freshen-up before dinner. Evening: Time at leisure at the lodge. Enjoy your last night in Tanzania among your newfound Road Scholar friends. Activity note: Hotel day rooms in Arusha - checkout is at 6:00 pm in preparation for a group transfer to the international airport. This marks the end of your Road Scholar program. Please note that your program does not include overnight hotel reservations for this evening. Morning: Begin transfer to Arusha. Before reaching Arusha, we will enjoy a visit to the Cultural Heritage Center, located outside the city. Lunch: At a local restaurant en route. Afternoon: Transfer to the Mt. Meru Hotel for day room accommodations. Participants will be able to rest, finish packing luggage, or freshen-up before catching a night flight to the U.S. Before leaving for the airport, enjoy a light snack at the hotel. Check-out at 6 p.m.
Evening: Transfer to the Kilimanjaro International Airport and check-in for overnight flight to the U.S. This concludes the program. We hope you enjoyed your Road Scholar adventure! When you get home, remember to stay in touch via the Road Scholar Social Network; share memories, pictures, and comments about your recent travels. Day 13: Return Flight to U.S. This attractive, modern hotel sits on 9 acres of landscaped grounds in the town of Arusha. The international airport, located on the outskirts of the city, is approximately 30 miles away. The lodge is located less than 5 miles outside the main gate to Tarangire National Park. This attractive African camp is well-situated near the main gate to Manyara National Park. Camp grounds face Lake Manyara and the Rift Valley escarpment. The semipermanent tented camp in the Central Serengeti region is made up of a small number of guest tents, a main dining tent with bar, and an outdoor sitting area for guests to enjoy some evening conversation around the campfire. Mobile tented camps provide an authentic safari experience without giving up on comfort. This seasonal tented camp in Southern Serengeti is made up of a small number of guest tents, a main dining tent with bar, and an outdoor sitting area for guests to enjoy some evening conversation around the campfire. The lodge is strategically built on the rim of Ngogorongoro's large crater, affording amazing views of the crater floor and its diverse wildlife. Buildings were constructed out of mostly local materials, including stone and wood. Rooms have large windows facing the crater. Lucas John Mhina was born and raised in Arusha, Tanzania. His parents are from two different tribes in coastal Tanzania and from the Mount Kilimanjaro region. He studied in England at East London University, in Kenya at Nairobi's Strathmore College, and received further training in educational excursion leading and first aid while in South Africa. Lucas has a keen interest in ecology and truly enjoys sharing his vast knowledge of the birds and wildlife of East Africa.